RDA Brisbane hosted its 5th CLICK! Digital event last month, once again cementing its place as SEQ’s foremost event to help enterprises transform and grow in the new digital economy. CLICK! 2017 was held on 1-2 September at the Brisbane Convention & Exhibition Centre, drawing nearly 1000 businesses, startups, not-for-profits and motivated individuals wanting to increase their digital and business skills, and boost competitiveness and innovation. Based on feedback from CLICK! 2016, this year’s event featured an expanded 2-day program packed with sessions run across 6 seminar rooms, with new masterclasses and hands-on business development workshops added to the lineup, as well as the ever-popular digital seminars that CLICK! has become known for. The workshops were organised and sponsored by CLICK! Founding Partner CEA, who run the Australian Small Business Advisory Services (ASBAS) program in Greater Brisbane. Workshop topics covered the five key elements of the ASBAS program: financial analysis, how to sell, talent & team, management capabilities, digital engagement and building your business. CLICK! 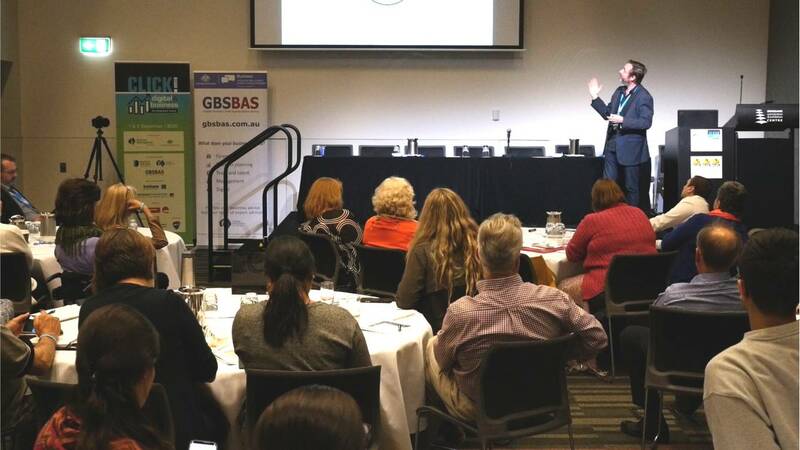 2017 Main Event Sponsor Brisbane City Council and its economic development agency Brisbane Marketing also presented sessions, and Australian Government departments (including business.gov.au) presented at a special Government Initiatives for Small Business workshop. Starting up and entrepreneurship was a key focus this year, with global innovator Kevin Harrington – the original ‘Shark’ on the hit US TV series Shark Tank, inventor of the infomercial and pioneer of the “As Seen on TV” industry - sharing his secrets in two sell-out sessions. In a morning keynote seminar, Kevin explored how to build a winning business from an idea based on his 40 years’ experience. This included how he managed to refocus his entire empire to adapt to the new digital reality: an audience no longer watching TV en masse, and instead getting their information through a myriad of digital channels. Kevin also headlined the CLICK! Oz Pitch Tank special event, where five SEQ innovators pitched their business ideas, with the potential to connect their product or service to the global marketplace through OzInnovators, Kevin’s Australian partner. 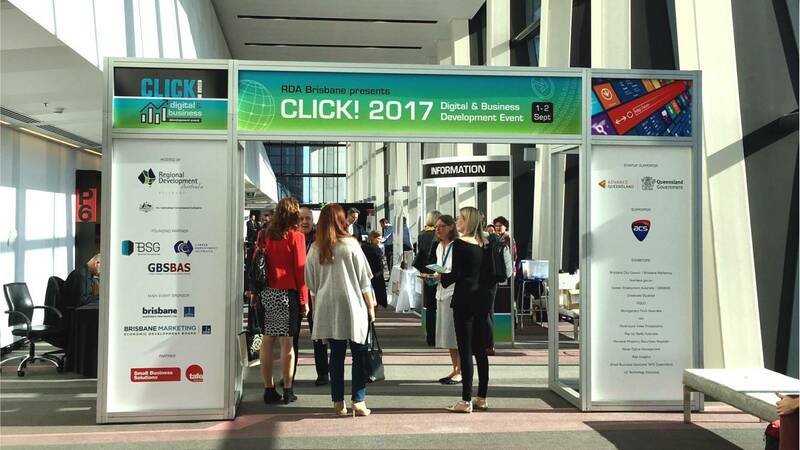 Thanks to funding from Advance Queensland, five SEQ digital startups with high growth potential were able to exhibit at CLICK! 2017 for free, and they, along with the 200+ other startup attendees, enjoyed access to the full CLICK! startup program. They exhibited alongside major government agencies and departments including nbn, TAFE Queensland, business.gov.au, Brisbane City Council and Brisbane Marketing. As usual, CLICK! featured a packed digital seminar program to help attendees compete in 2017 and beyond, with speakers covering digital marketing, digital strategy, fintech & e-commerce, video, cloud, mobility, social media and startup topics. The masterclasses included a special half-day session on digital transformation for not-for-profits, and comprehensive social media sessions on both days with the award-winning Yvette Adams (The Creative Collective). 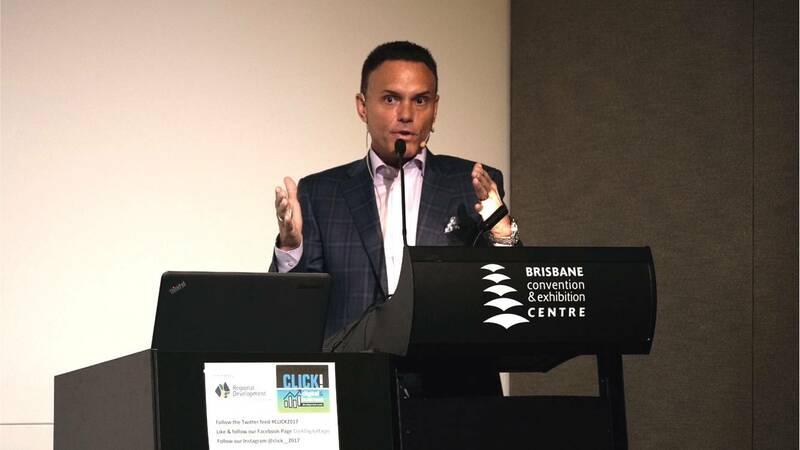 RDA Brisbane Chair Shane Fracchia said the CLICK! event had evolved over the past five years with the changing digital and technological landscape, and continues to be a prime source of inspiration, information and contacts for its diverse audience. CLICK! is a free entry event, staged and organised by RDA Brisbane, and made possible with funding from partners, sponsors, exhibitors and grants.